Paul Eggen is a fixture in Rosemount, and the Rosemount Rotary Club is pleased to announce that Paul has started his one-year term as President of the Club. As a young man thrust into owning an insurance office, Paul was faced with managing his office and employees, while also working to grow his business by focusing on earning his clients' trust. His humble duties early on included janitorial, bookkeeping, HR, office management, sales and service. He took advantage of the programs State Farm offered and was active in the chamber of commerce along the way. This strategy helped turn a surviving insurance agency into a thriving one. Through the years, Paul has volunteered in the community in many roles, including as a Youth Coach (served on the Board of the Eagan Athletic Association); Church (Council, Stewardship Chair, Sunday School Teacher & Treasurer); Rosemount Jaycees (Past President); YMCA (fundraising and past board member); ISD 196 (Citizens Curriculum Committee & Long Range Facilities Committee); Special Olympics; Neighborhood Help Services; Dakota Regional Chamber of Commerce (past Chair – current Ambassador and Board member); CAP Agency - Rosemount Meals on Wheels (driver since 1989); Community Action Council now 360 Communities - the Ways to Work Committee and Family Resource Center; and last, but certainly not least, Rosemount Rotary Club – (Past President, Foundation Chair). Paul has been recognized with the State Farm Golden Triangle Award. He has also been recognized as the Rosemount Business Person of the Year. In 2017, Dakota County Regional Chamber of Commerce recognized Paul with its Legacy Award, a lifetime service and achievement award. Rosemount Rotary looks forward to doing good in the community and around the wold under Paul's watch. 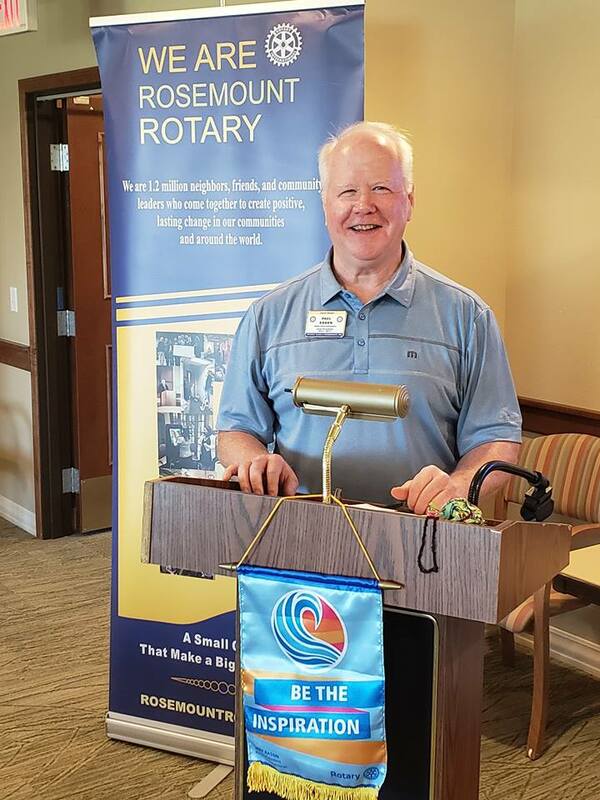 In keeping with this year's Rotary International theme, Paul has already been reminding Rosemount Rotarians to "Be the Inspiration." Thanks to Paul Eggen for his service in the past, his leadership in the present, and his willingness to inspire Rosemount Rotarians to accomplish great things in our community and around the world.